School sports recession: Not in Texas! Most of the nation’s school districts are slashing away at their sports budgets (Just do a Google News search for “school sports budget cuts,” and wait for your community to appear). 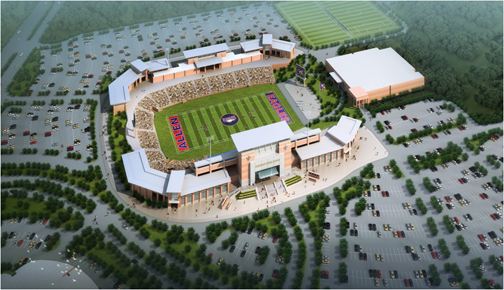 I’d love to opine that Allen, Texas, is a prime example of a community whose priorities are seriously out of whack, especially because the local high school already has an air-conditioned indoor football practice facility, something a lot of colleges don’t have. Except that Allen, Texas, is a prime example of a community that seems immune from the Near-Great Near-Depression. Allen, Texas, voters passed a $119 million bond issue in May 2009, when it still looked like we might all survive on the meat of our grandparents, cooked up in squatted McMansions. Allen is a fast-growing community of 77,000 in a fast-growing portion of the Dallas metro area, and it’s a haven for Texans who actually feel like investing in education is a valuable thing, beyond buying new textbooks dedicated to the history of Phyllis Schafly. Allen has, in the past, also passed bond issues to build facilities related to actual academic education. Plus, I come from a state (Indiana) that has something like 19 of the 20 largest high school basketball gyms, places where the arenas sit more people than live in town. So I can’t really argue too much — except to say if the economy ever goes south in Allen, Texas, that football stadium is eventually going to be a white elephant. But that day, in Allen, is a long way away.